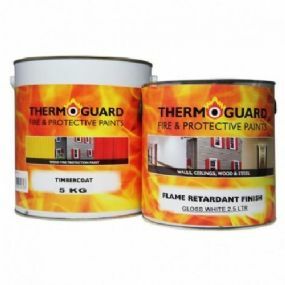 Thermoguard Timbercoat Door Upgrade Kit is an intumescent paint system to upgrade doors to 30 minutes fire resistance & 30 minutes fire doors to 60 minutes. Available as a convenient pack containing the required basecoat & topcoat to protect 2 doors in white or an assortment of Ral colour standards in eggshell or a gloss finish. Solid, joint free doors with compressed core and a reasonable thickness (6mm+), veneer faces bonded to either side of the core. These can be flush doors or pressed to create a moulded look. Seasoned, old or sturdy doors with 35mm+ thick frames and solid panels 10mm+ thick. Certain other doors that are not prone to premature collapse. Please Note: Well seasoned or old, sturdy doors with panels 8mm thick can be upgraded if additional “sacrificial” ply panels 6mm thick are fitted in the panel recesses & held in place by the door’s beading. If your doors are in a category which could be upgraded submit your assessment to your Authority, for approval prior to purchase. A Fire Certificate for Authority approved projects are available following completion & proof of purchase. Please note: Remember, intumescent paint is just one element of protection and DOES NOT create a ‘fire door’. Intumescent materials & hardware must be used to ensure your doors meet the required standards of your authority. A fire certificate for 60 minutes on 30 minute Fire Doors based upon the test and recorded evidence referred to above. 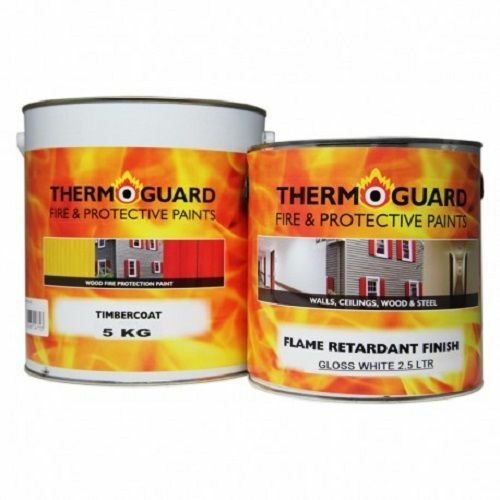 Apply 4 coats of Thermoguard Timbercoat @ 7m² per litre / per coat. Thermoguard recommend intumescent strips are fitted around the door edges or in door casings.